I first tasted this dish at Yo China restaurant. 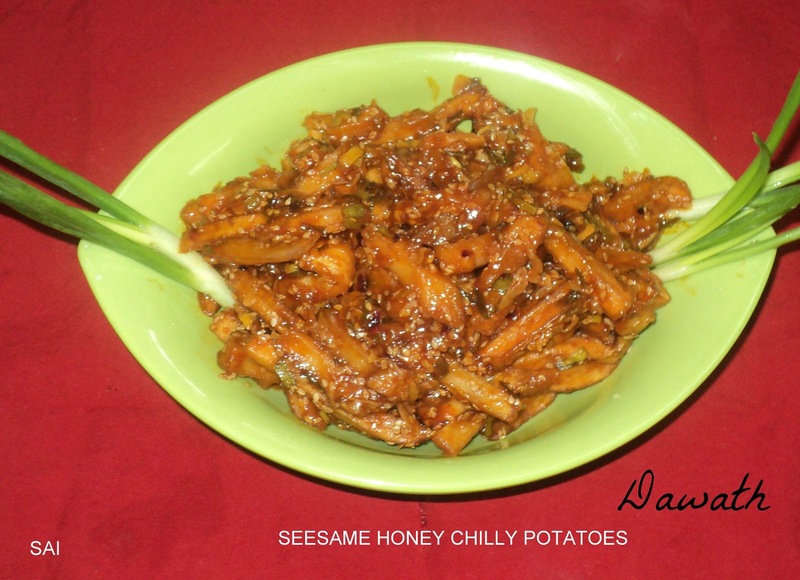 But ever since they closed their Mangalore branch for the reasons unknown, was missing the dish terribly.A year back I experimented this dish with different variations and it became a superhit at our place.This is a very popular Chinese starter.These potato fingers glazed with the sauce and honey tastes extremely wonderful.A must try dish. Wash,peel and cut the potatoes into wedges. Apply salt,cornflour and deep fry until crisp and keep it aside. Heat oil in a wok,fry chopped garlic until light red in color. Then add red chillies,tomato sauce,soya sauce,red chilly sauce,vinegar,honey,salt to taste and chilly powder. Add french fries,spring onions and roasted white til and give it a stir. You may adjust the sauce accordingly. You may also readymade french fries packet.